Who said white wine doesn’t go with beef! Thai beef salad using Wagyu Rump – paired with Margaret River 2008 Mount Horrocks Riesling – Clare Valley. Whilst the tail end of summer is still with us for the most part of Asia and the northern hemisphere, or forever summer in the tropical regions, one of my favourite Thai-inspired dishes is suitably appropriate, pairing perfectly with crisp, tangy whites, and reinforces throwing out the ‘old school’ rules of red wine with red meat moreover, being adventurous when it comes to pairing wine with Asian cuisines. I am sure many of you have tried beef salad, ubiquitous on Thai restaurant menus. Unfortunately it is invariably quite ordinary or poorly executed – mouth-scorching chilli, overcooked miserable pieces of the absolutely cheapest-toughest cut of beef, chunky raw onion and tomato and a token few garden mint leaves all drowned in lime juice. Indeed, I have yet to encounter a version as good as mine – well actually it is my wife who has perfected this recipe which I have subsequently plagiarised! My/our version is an adaption of the northern Thai beef salad nahm dtok, referring to the juice running from a piece of meat grilled medium rare. It is precisely the quality of the cut of meat you use and how it is cooked that makes (or breaks) this dish. Before you rush off and order up a prime tenderloin or sirloin, it does actually require a cut that has a little crunchiness or firmer texture, namely rump, to work with the textures of the salad. Having experimented with rump from all number of different breeds, feed-types (grass feed, grain feed) and different countries, I believe we have found the ultimate beast/cut; Margaret River Wagyu rump. Wagyu is known worldwide for its intense fat marbling with many people associating it to the black Tajima-ushi breed of Kobe, Japan, and served up raw in divine, mouth-melting fine slices or seared for a few seconds in small chunks, all at eye-watering prices! It is normally so rich and intense in its creamy fattiness that only a small serve will saturate even the most carnivorous palate. There are however many grades of Wagyu, in the sense of marbling content, and the different parts of the animal have less fat than others, the rump being relatively the leanest. And before you start thinking this is not going to be a healthy dish, the intramuscular fat in Wagyu cows is different to that found in other cattle breeds. Apart from being a great source of vitamins and nutrients, Wagyu beef contains higher levels of oleates, that is mono unsaturated acids (good fatty acids) including Omega 6 and Omega 3 oils, which protect the human body from heart disease, high blood pressure, arthritis, depression and Alzheimer’s disease…so there you go, now where was I…? Ah, just a word on the meat source, quality and provenance; it is from Margaret River Farms, which have 70,000 hectares of land spread across four properties in pristine environment in the far south of Western Australia. The cows are raised free range, grazing on natural pastures totally free of any genetically modified feeds or any antibiotic-hormone growth nasties. Their diet is supplemented by a controlled ration of wheat, barley, oats, canola, lupines and straw. Essentially this is about as natural as it gets, grass fed, roaming free in one of the cleanest environments in the world; a stress free, very happy cow. Well, as happy as a cow can be. Most butchers will store in their back fridge, whole Wagyu rumps, a dauntingly colossal chunk of beef as a whole piece weighing around 7 to 8 kgs, however they will carve off a piece of any proportion/weight to suit your needs. I will be going in to the merits of doing a whole rare-roasted rump in my next instalment. For the purpose of this exercise, you need a slice or two, depending on how many mouths you are feeding, about 3cm or just over an inch thick. Laying it down flat cut again to widths of about 5cm or divide evenly depending on the width of the slab of meat, also discarding the outside layer of fat. These strips need to be marinated, preferably overnight although for 4 or 5 hours is ok. See preparation. If Margaret River Wagyu is not available you can of course use Japanese Wagyu, although ask for a lower grade of marbling being clear to explain the intended purpose. Shopping for the salad leaves and mints may well take some extra effort, quite likely not available from the one source. Most supermarkets have excellent mixed leaf or mesclun salads, likewise fresh garden mint. Laksa leaves are also generally available; perhaps try the wet markets or local Chinese suppliers. Marinating the beef: Place the strips of Wagyu on a board patting out flat and with a table fork liberally puncture the meat with holes, turning the meat over and repeating until sufficiently perforated. Now, you don’t need to do an Anthony Perkins on the meat and murder it, just enough perforations to allow the marinade to permeate the meat. Place in a flat dish and liberally saturate with Thai fish sauce rubbing it in to the meat, turning over a few times. Cover with cling-wrap and return to fridge. Ideally this would be done the day before however the same day is fine but the longer it marinades the better, as it is almost like semi-curing the meat. Remove from the fridge well in advance of cooking so the meat comes up to room temperature. The salad: Wash the salad and mints in advance, but not too well ahead as the mints will start to wilt. The mixed salad leaves is the easy bit however plucking the mints is time-consuming so make sure you start on this in good time, or enlist help. How much mints you add is a matter of personal preference/taste. My wife tends to be judicious whereas I like to add in heaps and love the edgy bite and lift they impart. Ensure everything is well washed and spun dry, returning to the fridge. Peel and slice the shallots. In a large wok or frying pan, slowly cook the shallots in oil so they are soft and transparent, watching not to brown/burn. Add in the tablespoon of sambal and brown sugar stirring in for a few minutes so the sambal is cooked through and turn of the heat, allowing this to cool. Cooking the meat: You should only do this about 20 minutes before serving, as you want the meat to be lukewarm, but also adequately rested. The important facet here is to sear the meat quickly in a very hot pan or even better on the BBQ, but it is strategic that you sear, not stew the meat. Pat the meat dry with a paper towel, as excess marinade will induce stewing. It should only take a few minutes each side to achieve this. 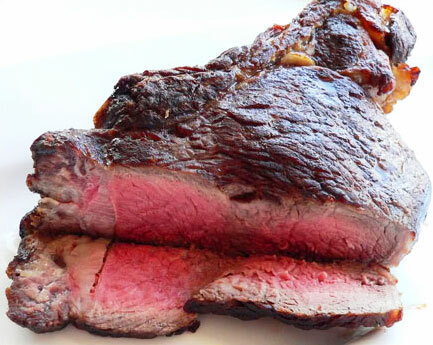 Remember, you are serving this medium rare and the slices are relatively thin. If using a pan, do not crowd as the juices and marinade will make it difficult to sear effectively. What you are looking for is nicely browned meat on the outside and rare-ish inside with a certain amount of the juices retained. This is where the Wagyu is superior, in retaining the juiciness and texture with the fat now melted in to the meat. Like all meat, allow to rest after cooking but make sure you retain the juices and pour this in to the onion/sambal mixture. Squeeze the lemons and limes whilst the meat is resting. Then slice the meat across the width in to desirable pieces, that is not too thin, not too think – maybe half a centimetre – up to you. Mixing the salad: Add the salad leaves to the wok or pan with your onion/sambal mixture then roughly chop the mints (use a large chef’s knife and literally just few chops) as this helps release their scents and flavour, add in to the salad. Now add the lemon and lime juice gently tossing/working this all through and taste for saltiness and tanginess, adding more Thai fish sauce or lemon/lime juice accordingly. Finally add the sliced meat and then transfer to a large serving bowl or platter. Voila! Don’t be put of by the longwinded instructions; it is actually a very straightforward dish but as always, the devil is in the detail, and with a little forward planning and practice/technique you will find this an excellent one-bowl dish that can be served as entree or a casual main course for a weekend lunch or light meal sitting outside on an evening. And the wine; well there are many white wines that would fit the bill, as long as they are crisp, with racy acidity and generally no oak, or a least unobtrusive oak, such as sauvignon blanc from Sancerre and Pouilly-Fume, semillon from Australia; perhaps a gruner veltliner from Austria or even a dry rose from Provence. My ‘perfect match’, tried and tested, is a tantalizing tangy and crisp Mount Horrocks Riesling 2008 that sings with lime and lemon with a mouth-watering succulence of fruit yet possessing an invigorating cut of fresh acidity to keep pace with this lively salad. Riesling is probably the consummate Thai cuisine wine, in the sense of its inherent power to keep up with challenging flavours and its defined lemon/lime/citrus backbone obviously synergistic with many core ingredients of Thai cooking. In this particular dish, you find both the lemon/lime flavours and the mints marry perfectly with the attributes of Mount Horrocks Riesling. There is a bourgeoning global revival in the appreciation of riesling however, paradoxically this noblest of white grapes is struggling in the Asia market, or perhaps specifically the Asian consumer whose preference is clearly towards red wines. There is also ambiguity in terms of rieslings status in the pecking order of premium wine and wine elitism. However, there are distinct, favoured riesling vineyard sites and soils around the world, begetting truly distinguished wines that are expressive of their unique geology and climate, or terroir, endowed with an encompassing spirit of place and indisputable authenticity. One such blessed place is the sub-region of Watervale in the Clare Valley, South Australia, a distinctive Australian terroir and one of those truly special pieces of earth that transposes itself nakedly through the venerable riesling grape, redolent in minerals as if taking a spa in a limestone solution. Almost all the rock in the Clare Valley is of sedimentary origin, from a period between 800 and 500 million years ago, during the Neoproterozoic era, the receding oceans and glacial movements that linked Australia with Antarctica deposited silt, sand and carbonate in a largely marine sedimentary basin, forming chalk, limestone, sandstone and shale with top-soils rich in minerals. Much of Australia’s ancient metamorphic crust has eroded over the passage of time with tectonic plate movements creating mountains and ranges, such as Mount Horrocks and the Clare Valley’s U-shaped ranges, with Watervale at the apex. The harsh environment of Australia and the Clare Valley’s dry Mediterranean climate may seem an unlikely match for riesling however, in Watervale at 1,300 feet (396 meters) above sea level, both altitude and sea breezes off the Spencer Gulf and Great Southern Ocean temper the hot, sunny days with very cool evenings enhancing the natural acidities, vital to rieslings core. It is well-known fact that riesling expresses the soil it is grown in more than any other grape variety and just happens to be one of those varieties that is best left to its own devices, unadulterated by wood (oak), it is principally fermented and matured in stainless steel, temperature controlled tanks. Subsequently, the less intrusive or lower labour-intensity in the winery is often reflected in the affordability of many rieslings however this should not be misinterpreted as being inferior, to the contrary riesling will outlive (bottle age) any other white grape variety moreover, arguably outclasses and over-delivers in price/quality rapport than any other grape period. Perfumed with a melange of ripe stone fruits; peach, apricot, juicy nectarine along with tropical tones of passionfruit, fresh pineapple, guava and fresh figs with a background of lime sherbet, lemongrass and fresh mints; juxtaposed with custard and honeysuckle/clover honey nuances and pronounced chalky minerals. There is still youthful estery semblance and seductive filigree that that draws you to the glass in anticipation of succulence and freshness. Explosive palate entry with a rush of piquant lime saturating the mouth, tantalizingly juicy with tangy blood orange and grapefruit flavours, builds in intensity with crisp green apple tartness and pickled ginger spiciness with persistent lemon-edged acidity kicking in – ethereal, slippery-textured wine, seamless and poised with racy, refreshing-invigorating acidity and lingering wet limestone earthiness and a chalky dry sea-salty tailing. Impeccable balance and very approachable right now, defying its only short period in bottle, more so the fact it will cellar for 10 years or more easily. Australian riesling does not come much better than this moreover, this has to be one of the white wine bargains of the world.